The archives are arranged as series within the United Nations office or agency that created them. The creating agency could be a United Nations department, mission, tribunal or any other United Nations functional unit. The United Nations archives cover these broad areas: Predecessor Organisations, Secretaries-General, Secretariat Departments and Field Operations. Finding aids can be used to gain an in-depth knowledge of a specific office, field operation, or person. They contain the same information as the search engine, presented in a different format. Under Article 97 of the Charter of the United Nations, the Secretary-General is appointed as the Organization's chief administrative officer by the General Assembly upon the recommendation of the Security Council. The current Secretary-General, as of 1 January 2017, is Mr. António Guterres (Portugal). His predecessors are: Ban Ki-moon (Korea) who served from January 2007 to December 2016; Kofi Annan (Ghana) who held office from January 1997 to December 2006; Boutros Boutros-Ghali (Egypt), who held office from January 1992 to December 1996; Javier Pèrez de Cuèllar (Peru), who served from January 1982 to December 1991; Kurt Waldheim (Austria), who held office from January 1972 to December 1981; U Thant (Burma, now Myanmar), who served from November 1961, when he was appointed acting Secretary-General (he was formally appointed Secretary-General in November 1962) to December 1971; Dag Hammarskjöld (Sweden), who served from April 1953 until his death in a plane crash in September 1961; and Trygve Lie (Norway), who held office from February 1946 to his resignation in November 1952. Archives of all former Secretaries-General are available for consultation. Registry Files: the first records registry was set up during the London period of the Preparatory Commission of the United Nations (between 21 November 1945 and 31 January 1946) and patterned after that of the British Foreign Office. The system was discontinued in 1979, however, the fonds include records dating up to 1983. The registry system was succeeded by decentralized recordkeeping by departments in consultation with the Archives Section's records management programme. Non-registry records: arranged according to the departmental organization of the Secretariat (from 1946 to present), include the archives of: Office of the Secretary-General, Office of Legal Affairs, Department of Economic and Social Affairs, Office of Public Information, Department of Trusteeship and Non-Self Governing Territories, Department of Political and Security Council Affairs, and many others. These records come from various missions and commissions that have been established by the Department of Peacekeeping Operations, the Department of Political Affairs, the Security Council, and the Secretary-General. These are international organizations that pre-dated the United Nations. 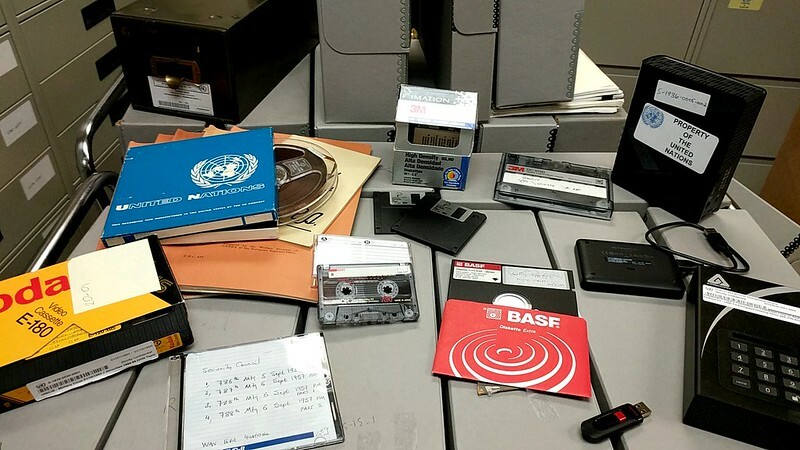 When they closed, it was determined that the UN Archives was the most appropriate repository for them, due to their content and historical importance.